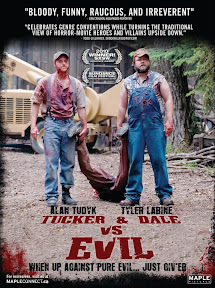 Home » magnet releasing , movies , tucker and dale vs evil » TUCKER & DALE VS. EVIL is finally coming to theaters near you! TUCKER & DALE VS. EVIL is finally coming to theaters near you! It was April of last year that I caught Tucker & Dale vs. Evil at the first ActionFest film festival in Asheville (slash here for my review of it then). And it was almost one year ago that I ranted about how this movie SCREAMS for distribution! Heck it should have come out last summer: no doubt it would have been the sleeper hit of 2010! Well, all these very long months later, Magnet Releasing has picked up the film! It will be released theatrically on September 30th and in video on demand on August 26th. If I might make a suggestion: don't see Tucker & Dale vs. Evil on your teeny tiny monitor at first! This movie deserves to be first beheld on the big screen! I caught it at a midnight showing and it was a crazy good time had by all! Mash down here for more about the release. Thanks to Drew McComber and "Weird" Ed Woody for passing along the great news.